Question: I want to install a pool table light in my basement. The cieling is finished (sheetrock) and there is an existing canister light about a foot off center from where the light will hang. Is there a way that I can wire into the canister light and make it look good without having to rip out the can and repair the sheetrock? Someone mentioned a possible cover that can be put over the hole but I have never seen such a thing. Answer: Hi Dave,You can drop the can out of the ceiling to access it's junction box. 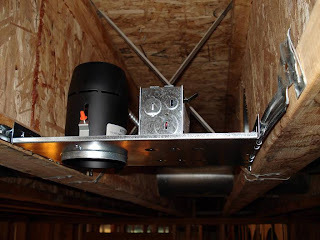 After you tap into the lights power supply and fish a wire over to your new light you could get an in the ceiling speaker cover to hide the hole and have a finish look for your ceiling.